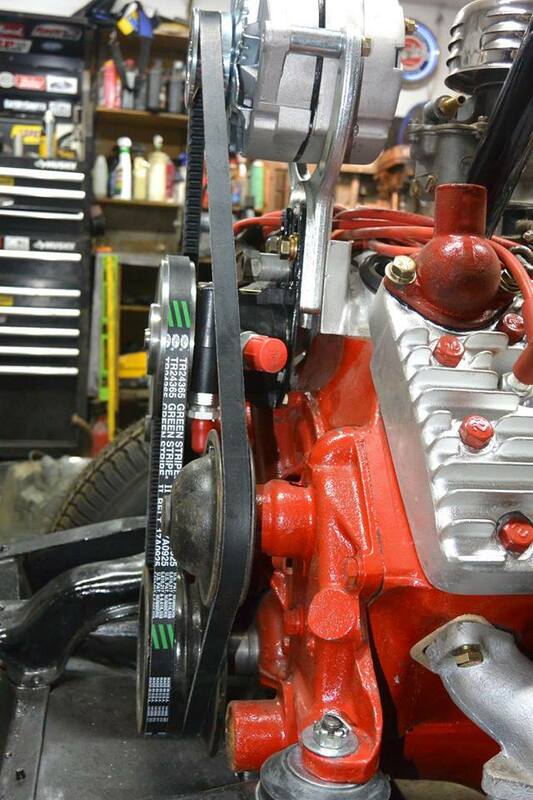 Member supplied this info: This set up is being used on a 1948-1950 Ford truck but could be adapted for other Fords. I bought the pump from eBay. It is a Tuff Stuff 6170ALB Type II Power Steering Pump. I took the pump, the steel plate, the belt and the original fan hub to a machinist and showed him what I needed. He made a pulley that fit the pump and matched the positioning to be the same as the fan hub. The bracket took two tries (and is not my best work but does fit and work well). I can take better pics and measurements next week. I took the fittings down to my local Gegg’s distributors who made the hoses for me. The steering gear is a Toyota 4×4. The adapter kit for the box I got from Mid Fifty f100 part. Now I just need to devise a reservoir. I think since I am not going to use an oil filter on the engine I will convert the filter canister to a power steering fluid reservoir and make it look even more stock. A special thanks to Larry Lorence for his info and images. This should help a number of our members. Think about becoming a Flat-Spot Premium Member. This group runs on membership and allows us to pay to keep everything growing. Best of all our membership has some great benefits. Annual Premium Membership is access to the Flat-Spot like never before. Revenue from this system will be used to encourage more in person events, connect you with exclusive deals and contests, and support our mission to provide a safe and exciting place for all skill levels to come together and help each other.